"We are Gotenks and we're gonna rock your world!" Hey Hey Hey! Gotenks is here! The first full character drawn by Daeron and coded by JustNoPoint, this is perhaps our most elaborate character yet. Ghost clones? Check. Entrapment Move? Check. In-game Transformation (yay!)? Check. 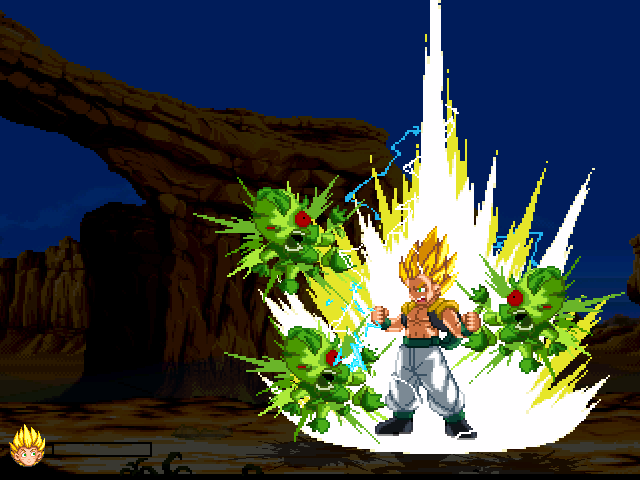 While Gotenks is pretty weak and has a tendency to rely too much on useless (but awesomely-named) moves, he's just a riot to play as and against. Check him out, he's truly wicked. Like what you see? Please donate to help the artists!